The SNO Emerging Investigator gives recognition to emerging scientists and engineers working in the area of Sustainable Nanotechnology. Environmental Science: Nano is pleased to announce the inaugural winner is Professor Debora Rodrigues. Professor Rodrigues research on carbon-based materials is well recognized and covers both applications of nanomaterials for improving water quality and implications on the safety of nanomaterials. As an independent investigator, she has published widely in these areas. In 2012 she received a U.S. National Science Early CAREER Award “Toxicology of graphene-based nanomaterials: A molecular biotechnology approach”. At the University of Houston, Professor Rodrigues is known as an outstanding researcher, a passionate educator and a role model. Editor-in-Chief Vicki Grassian says that Professor Rodrigues was selected because of her pioneering and outstanding contributions to the field of sustainable nanotechnology including nanotoxicology and applications of nanotechnology in water remediation. 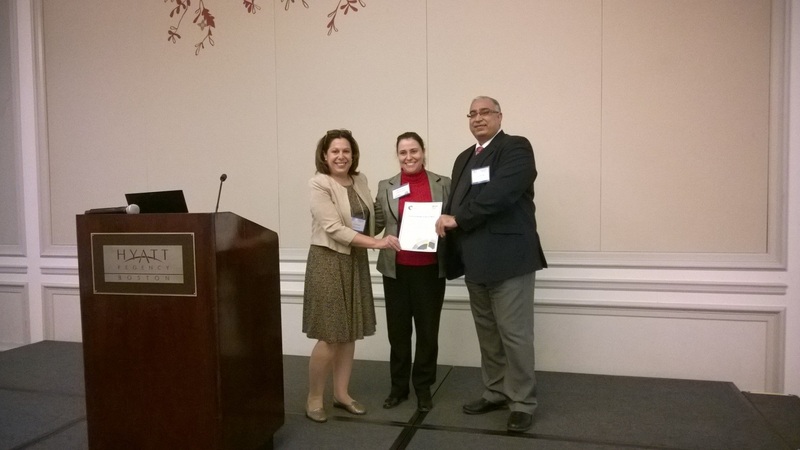 The picture shows Environmental Science: Nano Editor-in-Chief, Vicki Grassian (Left) and Executive Editor, Harpal Minhas (right) presenting Debora Rodrigues (middle) with her award at the 2014 SNO Conference. After completing her Ph.D. in Microbiology and Molecular Genetics at Michigan State University in 2007, Debora moved to Yale University focusing her research on investigating the antimicrobial effects of carbon nanotubes on viruses and bacteria as well as their impact on soil microbial community. In 2010 she became an Assistant Professor in the Department of Civil and Environmental Engineering at the University of Houston.